For those without comedic tastes, the so-called experts at Wikipedia have an article about The Church. 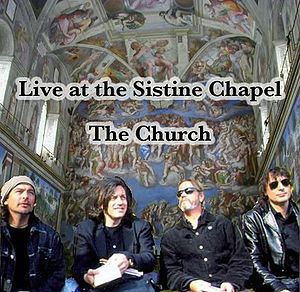 The Church are an Italian house band for the Vatican, contracted to fulfill all musical duties within the Canberra area. They are strong allies with The Bloody Spork, a group of internet paedophiles. From the start, there have always been four irreplaceable members of the Church, and the band lineup has never once changed. Steven Kilbey plays the harp and sings lead vocals, Marty Willson-Piper plays the flute (you should have seen that one coming. ), Peter Koppes provides backup vocals and plays the flamenco guitar, and Tim Powles plays the transistor radio. The four lads grew up together in the city of Rome and were selected by the Pope at a high school talent contest to enter into a lifetime contract as house band for Vatican City. In the past 26 years, the Church have become international superstars, playing on Saturday Night Live, the Howard Stern Show, Oprah Winfrey, and a Starbucks in Nebraska. Their hit single, "Maybe These Boys," lingered at #1 on the music charts in French Polynesia for eight weeks in 1993. Steve Kilbey can be found Sunday mornings on American public access television alongside his second cousin, Bono, hosting telethons for children suffering from various socioeconomic evils. In recent years there have been persistent rumors dogging the band regarding Kilbey's alleged non-Italian heritage, Powles having been spotted in a bar in Rome having a beer, and Willson-Piper threatening to leave the band in an outrage against these transgressions. The only band member relatively ungossipped about is Koppes, since he does not appear to ever speak, and only stands by silently with a gentle beatific smile. With the recent death of the Pope leaving The Church's contract in limbo, Steve Kilbey recently commented to Chicago's The Onion: "I think that I'd like to move to America and just live in like, Ohio, for a while. I've spent my entire adult life in the spotlight, and it's been great, but I really think it's time to leave Vatican City, and like, maybe grow a crop of corn. Or work for Microsoft." It is widely rumoured that The Chruch are heavy treacle sniffers and cipher large sums of their earnings off to fund the conspiracy to conceal the supposed secret treacle mine under York Minster. This page was last edited on 3 September 2012, at 07:52.